Love what you did here, if I didnt have a dog Id be copying this for sure! which rack is that? jcr? Excellent work 11C. Your build has inspired several aspects of my "paper" build thus far. What is your opinion on 3.73 vs 4.10 gearing for a DD/camping XJ with the 4.0L, AX-15, and 31s? Yup its the JCR! they put a very good price point on it. I find the 4:10s to be over geared for highway driving. 2750rpm at 70mph! i think i would do 3.73s if i would do it again. Great thread! Question: Do you have any rubbing issues with the 31s in the rear after removing one leaf? What about the front? I just installed a 2.5'' OME lift from DPG and really want duratracs. Unfortunately if i cant fit 31/10.5/15s I'll have to go 235/75/15s. Aren't you glad you went with a ax-15, I know I am! No issues with rubbing it the rear with the DPG bumpstop plates and replacement bumpstops. Very happy with the AX-15! Reading through your thread and I just ordered one of the Prime4x4 switch panels. I made one myself but have never been 100% happy with the finish... and these are on sale too. Love the rack...nice. Thanks! Run leads to your switches your not using right away so you dont have to tear apart your cener console just to run another wire! Looks great man! I got on to update my thread with my new storage system! I didn't get a chance to see this before building it. Mine turned out very similar regardless! I think you picked out the perfect height for the deck in my opinion.. I have been away for a bit and i am very pleased to see the attention this build got while i was away! Thanks for all the compliments. My father and i went on a 4 day fly fishing trip last weekend and the biggest headache was keeping all the gear in the jeep organized! I have been meaning to build this design i had for the last several months now. Anyway on the 4th day my dad and i were sick of getting rained on by these huge storms out here in colorado, so we set about to get this thing built so we would never have to deal with the messy gear again! We used about a sheet and a half of 3/4" 5 ply AC, 2ft of piano hinge, drywall screws, outdoor carpet, and 3m spray adhesive. 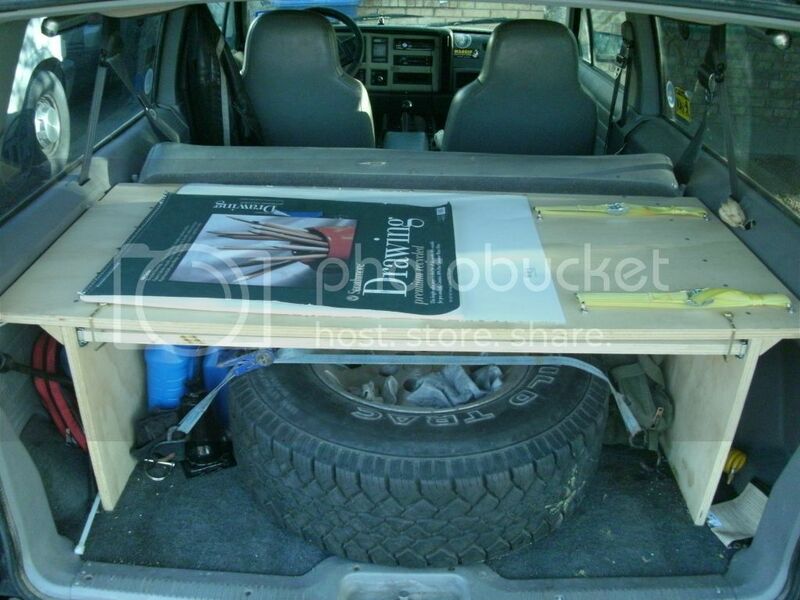 I wanted a flat deck and access from the rear and a place to mount a compressor and DC/AC inverter. I am very pleased with the results. The deck spans the full usable width and length of the rear area with allowing room for the passenger seat to recline to an acceptable sleeping angle. 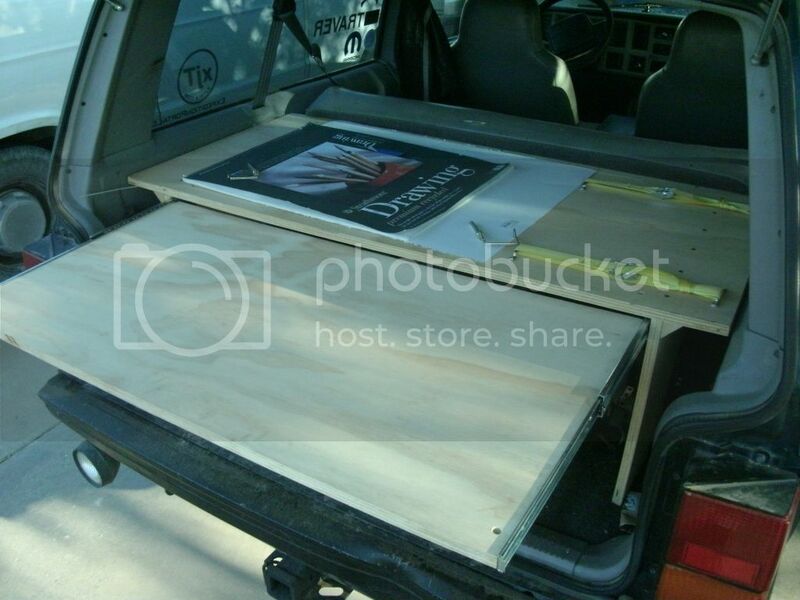 The deck fits within a 1/4" of the rear hatch. In the end it was about 140$ in materials. Not bad for how much of an impact this makes in organization. I figured the best place for the inverter would have to be outside the box. As far as the compressor mounting i wasnt very picky so i just tucked it in a corner to use as little room as possible. Wired the compressor to the Prime offroad switch panel. I have plans to add tie down tracks, lighting, dual battery, and a slide out table with a stove into the storage unit. Neat! Would be cool if you could push your front seats all the way forward and leaned forward as much as possible. Then have a section fold out with legs from your storage unit to create a sleeping platform. Not sure if there is enough headroom though. quick question for ya. now that you have had them on for a while what are your thoughts about those sliders again? I'm having a hella time figuring out which ones I want. I love the look of yours but if they arent rock solid then I will probably pass. I have had no issues with these sliders. they work great and are soild. If i were to do it again i would not use these though. I would get JCR standard sliders. Great pictures man. What is the odometer reading these days? I'm still on the fence of going 33x10.5 + 4.10s (common) or 31s + 3.73s (not common and may have to pay for regearing). Been thinking about getting the JCR rack with the extra bars things on the side. I really like how it looks.